VILNIUS – The costumes meant for Turandot opera performers have been stolen from a truck on its way from Germany to Vilnius, with the premier at the Lithuanian National Opera and Ballet Theater scheduled for March. The theater said the costumes were stolen on the night of January 17, near Gutersloh, North Rhine-Westphalia, Germany. The theft might undermine the theater's plans to perform the opera in early March after the global premier of Giacomo Puccini's opera staged by Robert Wilson took place at the Royal Theater in Madrid in November. Under the plan, the opera should have been shown in Vilnius next. "They were probably stolen during nighttime when the driver was having compulsory rest after inspecting the vehicle. In the morning, when doing the same after the night, he saw that the truck had been robbed and part of the shipment was missing," Julijus Grickevicius, head of marketing at the Lithuanian National Opera and Ballet Theater, told BNS Lithuania. In his words, up to 100 costumes might have been stolen, including the very expensive costumes of the main performers. The missing part of the shipment weighted around 600 kg. The shipment had been insured, with the loss estimated at several hundred thousand euros. Both the police of Germany and Lithuania are carrying out investigations, Grickevicius told BNS Lithuania. 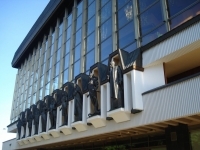 Jonas Sakalauskas, director general at the Lithuanian National Opera and Ballet Theater, says everything is being done for new costumes, identical to the stolen, to be made in time for the opera premier in March. The costumes were created by Italian designer Jacques Reynaud, with many part for them produced in Germany, Spain and Italy.